The MakerBot Certification Program offers participants two learning plans, or workshops, to introduce the use of 3D printing as a learning resource for the classroom and makerspaces. Participants first learn how to setup and operate a 3D printer in MakerBot Operator and then how to develop lesson plans or projects that enable students to use this technology for their own learning in Curriculum Creator. The two learning plans are sequenced, step-by-step learning experiences that employ text, graphics, voice-over and videos to introduce the ideas and concepts. Both plans are available online as fully self-paced lessons, however, they are offered in a blended format to some school districts. Sample lesson plans in the MakerBot Educators Guidebook include guidance on alignment to a variety of learning standards. 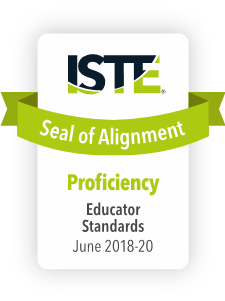 The MakerBot Certificiation Program underwent the International Society for Technology in Education (ISTE) Seal of Alignment review for Proficiency. Resources receiving this recognition offer the opportunity, encouragement, and resources for participants to show significant and substantive growth in the skills, dispositions, and behaviors identified in the standards. Educators who complete this course will have a thorough understanding of the ISTE Standards and will gain the knowledge and skills to create engaging learning experiences for students. “The learning materials in the MakerBot Program are packed with helpful information and manage to convey the excitement, innovation and creativity that 3D printing can bring to the classroom and makerspaces." 4.c. Use collaborative tools to expand students' authentic, real-world learning experiences by engaging virtually with experts, teams and students, locally and globally.